Rakesh Jhunjhunwala has recently sold 1.39% of it's holding in A2Z Maintainance, the company he was so bullish on that he bought over 16 lakh shares on the day of the company’s listing to spurt investor's confidence, to bring down it's holding in the company to less than 20%. 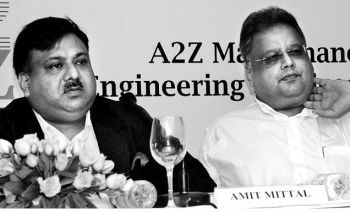 A2Z Maintainance came out with an IPO in the month of December 2010 at Rs 400 with Rakesh Jhunjhunwala openly advocating the prospect and sound fundamentals of the company and justifying the high price. The stock closed at Rs 333 on listing day itself as market was worried about the high valuation. To revive people's confidence Rakesh bought 16 lakh share that day itself somewhere near Rs 350 thereby trying to make market believe that the stock is attractive at that level. People blindly following this big bull are now licking their wounds as the stock is hovering around Rs 26 a massive fall of almost 94% from it's IPO price. Rakesh Jhunjhunwala's 21% stake in the company during the time of IPO was valued at around 620 crores which is now worth just Rs 40 crores as on 12th March 2013, a loss of almost Rs 580 crores.